Inspiration struck the other day. I looked into the fridge, trying to decide what to make with the ingredients in front of me. I spied chicken, cheese, garlic, tomatoes and basil. What else would I make but chicken bruschetta? 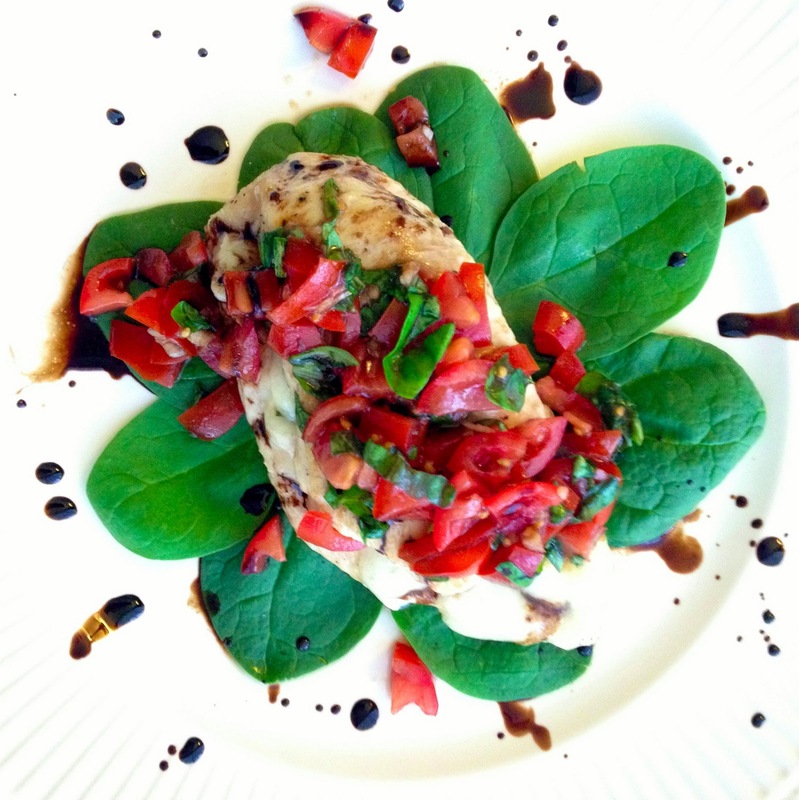 Never having made chicken bruschetta - let alone bruschetta, period - I used what I had and went loosely off the method for stuffing and cooking chicken in this post. The result was so, so good! It oozed freshness, and I quite literally gobbled mine down. It was altogether quite simple to make, too. I would definitely recommend this for new cooks, as its simple yet looks pretty darn fancy! The balsamic glaze really added something special to the dish, and it saves well, so don't skip out on it. Side note: balsamic glaze is merely a fancy way of saying you boiled and simmer balsamic vinegar for 20-30 minutes. Pretty sweet. 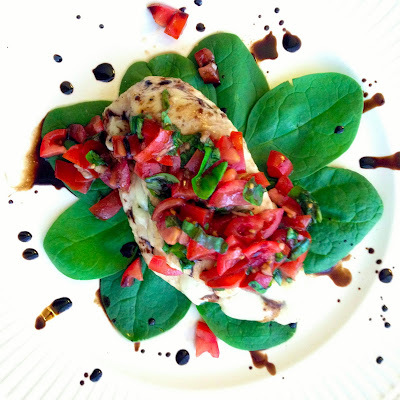 Balsamic Glaze: Heat a small sauce pan on high heat with 1 cup balsamic vinegar. Bring to a boil. Reduce heat and simmer 15-30 minutes, until balsamic is reduced to about 1/4 cup and coats the back of a spoon. Set aside. *Preheat your oven to 400 degrees. Heat 2 teaspoons of olive oil in a large ovenproof skillet over medium-high heat. *Combine cheese and 1 clove minced garlic in a small bowl. *Cut a horizontal slit along the thin, long edge of each chicken breast, nearly through to the opposite side, and open like a book. Sprinkle the breasts with salt and pepper. 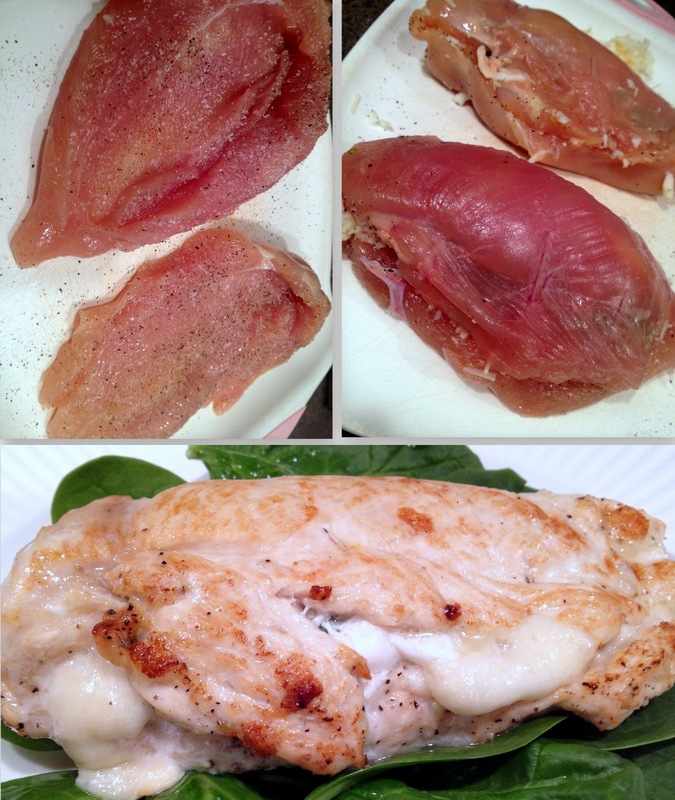 *Divide the cheese filling among the breasts, placing it in the center of each. Add 1-3 basil leaves to each breast, depending on the basil leaf size. Close the breast over the filling, pressing the edges firmly together to seal. Sprinkle the breasts with salt and pepper. *Add the chicken to the heated skillet and cook until browned on one side, about 2 minutes. Turn the chicken over and transfer the skillet to the oven. Bake until the chicken is no longer pink in the center and an instant-read thermometer inserted into the thickest part registers 165°F, about 15 minutes, depending on how large your chicken breasts are. 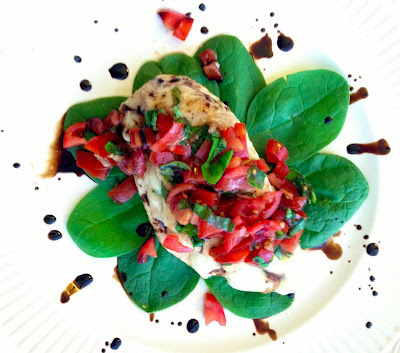 *Once the chicken is in the oven, finely slice/chop remaining basil leaves. Then, combine chopped tomatoes, 1 tbsp olive oil, 1 tbsp balsamic vinegar, sliced basil and 2 cloves minced garlic in a small bowl. Mix well and set aside. 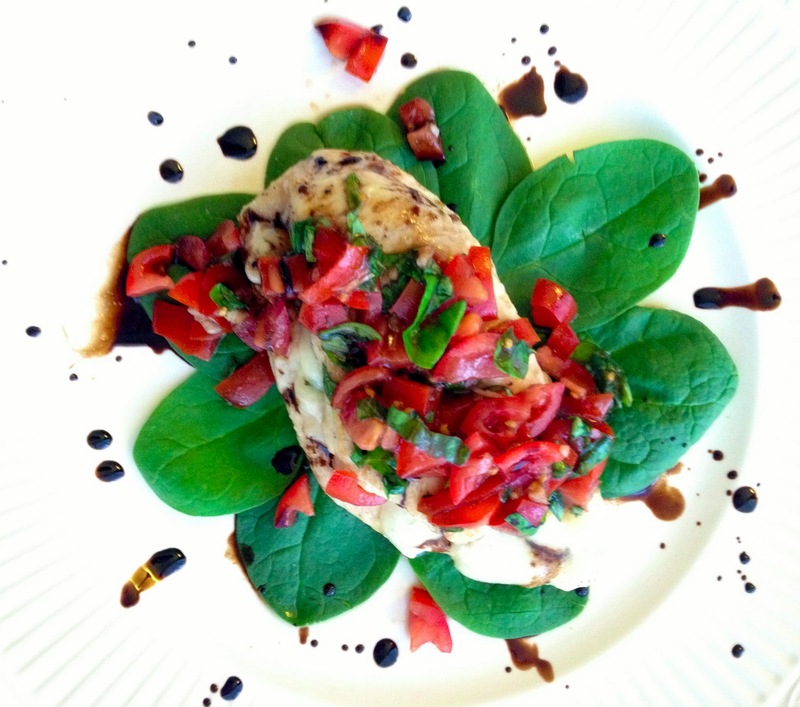 *When chicken is done, remove from oven and set over baby spinach leaves. 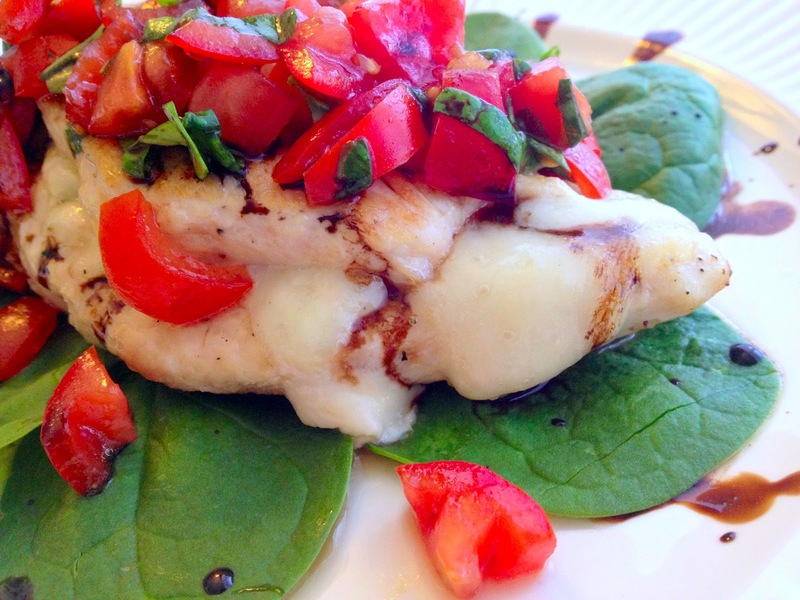 Top with bruschetta mixture and drizzle with balsamic glaze. Serve immediately!